Need Help With Snoring and Stopping Smoking? Here's a question I've been getting recently: Does quitting smoking help with snoring? I have a lot of personal interest in this question. No, it's not because I smoked. I never smoked. But most of the people in my family did. A few of them died of cancer because of smoking. I don't know how many of them snored. Almost all of the elders in the family are dead now so I'll never know. I suspect many of them snored because, yes, smoking cigarettes is one of the causes of snoring. Nicotine before bedtime is not only one of the causes of insomnia, it's also one of the causes of snoring. This is because of congestion in the throat and lungs. And nasal congestion is often one of the causes of snoring. There is also swelling in the mucous membranes in the throat because of smoking. The bad news is, I noticed growing up how much my family members all enjoyed smoking. And how difficult it was to stop smoking for those who tried to quit. 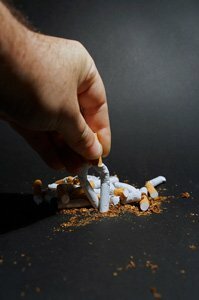 It's a tough habit to give up because of the ritual of smoking and the physical addiction. 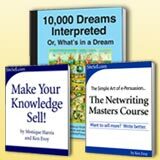 That's why I was intrigued reading in a hypnosis book I bought recently about how hypnosis can help a person quit smoking and, thus, help with snoring. Investigating this matter further, I learned about a medical hypnosis system called The Non-Smoker's Edge. It's having phenomenal results in helping people quit smoking. You can also get a 14-page FREE report called 10 Steps Toward A Smoke-Free Life by clicking here. Even if you've failed to quit smoking with everything else you've tried, this can finally work for you, as it has for so many others. See the link below to see what other former smokers have to say. On October 22, 2007, a study was released at a meeting of the American College of Chest Physicians. It showed that hypnosis was twice as effective as just trying to quit abruptly. 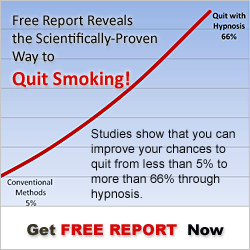 Even more surprising was that hypnosis was more than three times as effective as nicotine replacement therapy. So if one of your goals this year is to quit smoking and get help with snoring...why not give smoking-cessation hypnosis a try? And you'll sleep better at night! By the way, if you have a question about sleep and health you'd like me to answer, please go to my contact me page. You'll see it above to your left. Simply type in your question and send it to me. I'd love to hear from you. Some of my answers may be short so be sure to subscribe to my RSS feed because I may just post a short blog instead of a full article. See the orange RSS button up above also. Here's one final thought for this article on smoking and help with snoring. If you would like to see what other smokers have said about using hypnosis for quitting smoking, click here for Acclaim for The Non-Smoker's Edge. It's very eye-opening.